Set your sights on the horizon, and get ready to play the day away onboard the TAHOE Q7i. Take a quick cruise with your closest friends. Choose the optional ski pylon or wakeboard tower, and fine-tune your watersports skills. At 19′ 10″ long, the 500 TS is a midsize family sport boat with huge capabilities. The NEW for 2016 TAHOE® 450 TS family sport boat is guaranteed to make a splash with your family and friends. The NEW 2016 TAHOE 400 TS is nimble. She’s quick. And she’s always eager to spirit your family away on fun-loving adventures you’ll remember for years to come. Deploy the trolling motor and meet the sunrise with a fun-filled fishing contest. The TAHOE 550 TF proves you, family and friends truly can have, and do, it all. Cast out your concerns, and reel in a whopper bass. Crank up the throttle and leave your worries in your wake. The TAHOE 450 TF wears many hats. For one, she’s a fishing boat, complete with features like a trolling motor, removable casting chairs and an aerated livewell. Teach your kids the proper way to tie on a lure and light a passion in them for fishing. More features. More horsepower. More room. More versatility. The TAHOE 215 XI gives you more of everything so you can do more of everything! New for 2016, the TAHOE 2150 combines renowned Mercury® outboard power with our exclusive POWERGLIDE® hull design and a lengthy list of features to provide all the frills you need for unlimited thrills. The TAHOE® 1950 provides a whole new way for families to play away a day on the water. 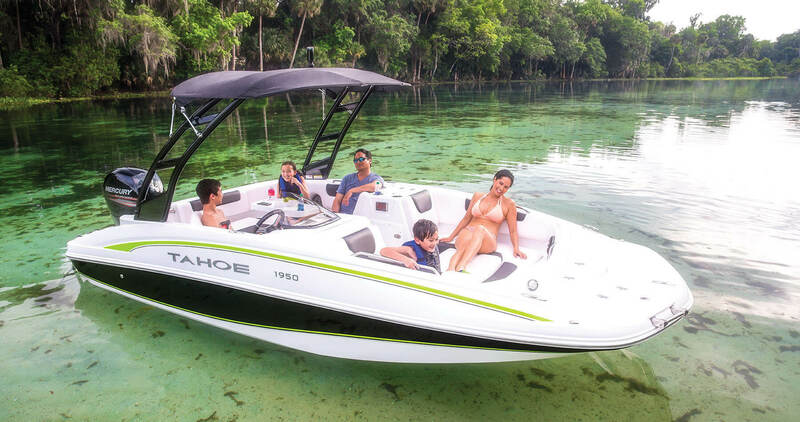 The TAHOE 195 is 19′ 11″ long, 8′ 6″ wide and decked out to perfectly align with your idea of the perfect day on the water.